It had been many years since she had visited this hidden grotto, her personal place to worship the goddess. She needed no torch to guide her in this dark place. Many years of visits had ingrained the details into her mind. 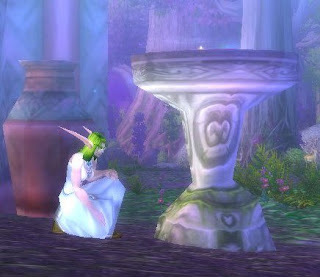 Though now a druid in training, this former priestess had never forgotten her first calling. Now wearing her old but well preserved mooncloth robes, as though it was only yesterday that she had been expelled from the Temple. It was after the Sundering, after the previous cataclysm, that she had been removed from the priesthood. Prior, priests of Elune had been able to cast arcane spells with the goddess' blessing. With the corruption of Lady Azshara and all that came with her lust for arcane power, use of these spells became taboo, and eventually were forbidden to the priests. This priestess' favorite spell had been the one known as Star Shards, dropping bits of starlight down from the heavens to harm her enemies. She refused to stop using her arcane spells, and so she was stripped from the priesthood, but she never stopped worshipping Elune. Thankfully the druids were more tolerant and took her in. She moves slowly and sensually, slender pale purple arms swaying rhythmically as she casts her spell, summoning a shaft of moonlight, the gift of Elune, purifying the area. The beauty of her movements and her dress, the pale blue of her robes accentuating the glow of her eyes, she knew would please the goddess, though she is not vain. She kneels and places her sacrifice on the altar, a bowl of juicy moonberries, and begins her prayer. She comes seeking guidance in her missionary work in the land once known as Draenor. Though the battle against the Legion in that world has been won, still it's corruption washes over the land. The goddess is pleased by her offering and grants her strength in her mission to quell such corruption, her skin briefly glowing with blue-white light as Elune's blessing washes over her. She bows her head in silent thanks. Hmmm... Very interesting ideas. Thanks for stopping by and giving me some food for thought!